Many people tell me they have more time for cooking in the summer when the kids’ schedules are much lighter and office hours are reduced. Great news! I do cook pretty consistently all year, but I find in the summer I have a little extra time for breakfasts other than a smoothie bowl. That’s probably why I teach a breakfast class every June. 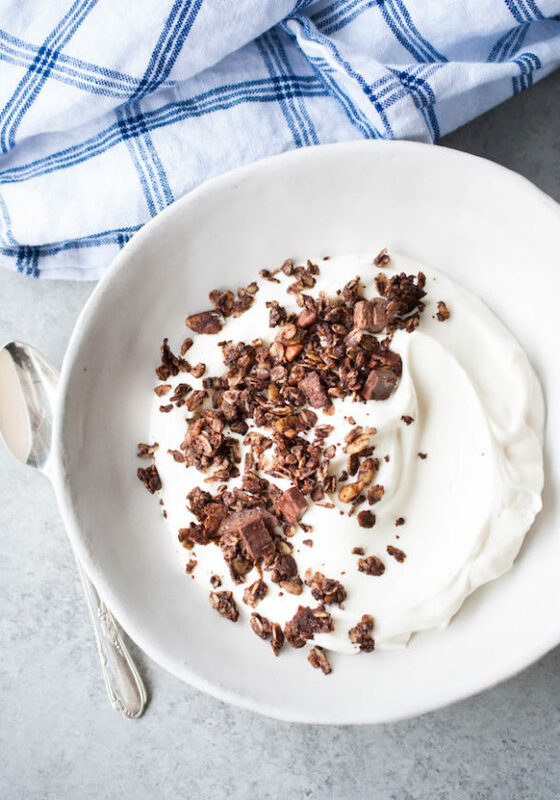 This year, this salted chocolate granola recipe was on the menu and it was a HUGE hit! 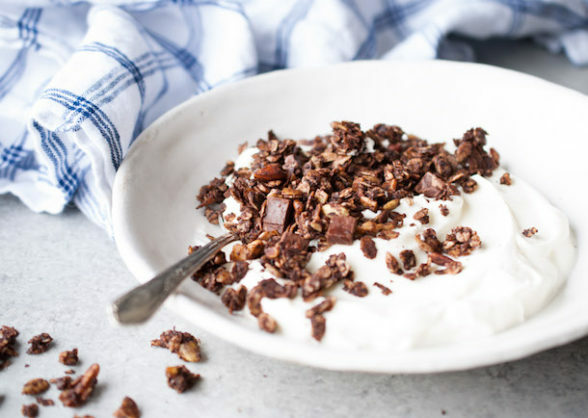 I created this recipe because I became addicted to Purely Elizabeth’s chocolate granola, which is so good, it’s dangerous. So this is my version, which is also so good, it’s dangerous! Even though Purely Elizabeth uses clean ingredients, I am confident that I use less sweetener and my granola is still beyond delicious. How can you beat dark chocolate and flaky sea salt? It’s the best combo! 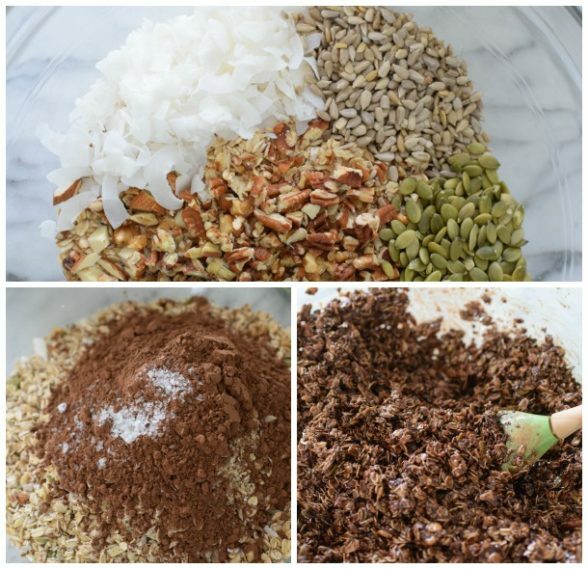 I took all the same ingredients that are in my standard granola – oats, seeds, nuts, coconut and chocolatized them! Sometimes I even add pieces of dark chocolate, which Purely Elizabeth does as well, but I save that batch of granola for snacks since eating chocolate for breakfast is a bit of a no-no. Although it is summer! I was eating a little too much of this salted chocolate granola, so I had the brilliant idea to put it all in the freezer. That way I wouldn’t eat it all, right? Wrong! Guess what? This is even better frozen! It is a light and crunchy granola that is just sweet enough without dried fruit which is typically in granola. My husband started an after-dinner trend with this granola. Instead of going for the ice cream, he takes frozen banana chunks and tops them with a few spoonfuls of chocolate granola and he loves it. So my point is that this granola is doing double duty as a breakfast and snack. You might try freezing it with yogurt for breakfast popsicles or adding it to the sauteed apple power bowl in my book. This would also make a fantastic hostess gift packaged in a cute glass jar with some twine. I am headed to NY today! It’s my high school reunion on Saturday and then I have work meetings and a cooking demo at DeCicco & Son’s on Thursday. I haven’t figured out the time yet, but check back to the events page which I’ll adjust as soon as I know. Lots happening this week, stay tuned! Preheat oven to 300 degrees. Line a rimmed baking sheet with unbleached parchment paper. In a large bowl, combine the oats, nuts, coconut, seeds. 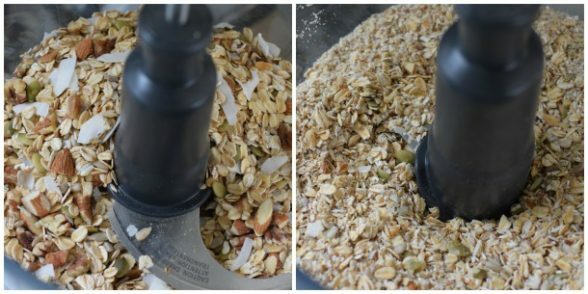 Measure out 3 cups of the oat mixture and pulse in a food processor until very finely chopped. 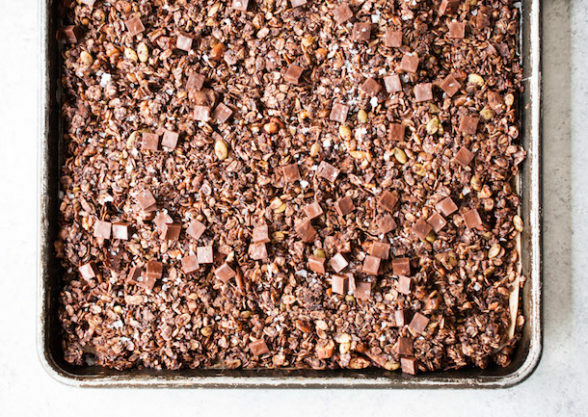 (This step is optional, but helps create more clusters after the granola is baked). Pour back into bowl with the rest of the oats/nuts/seeds and add the cocoa powder and 1 teaspoon salt. In a small bowl, whisk together the melted coconut oil, maple syrup, coconut sugar and vanilla. It is really important to mix the oil and syrups so that everything is well blended, otherwise the syrups may burn. Add the oil and syrup mixture to the nut/seed mixture and stir to coat well. Transfer to the prepared baking sheet and spread out evenly. Bake for 25 minutes, stirring once halfway through to prevent the bottom from burning. If your oven runs hot, take a peek around 20 minutes to ensure the chocolate is not burning. Turn off the heat, remove from the oven, add chocolate and sprinkle with remaining ½ teaspoon sea salt. Put back in the oven for another 45 minutes (and up to 2 hours – the longer, the better) so the chocolate melts slightly and the granola can continue drying out without burning. Remove from oven and allow to cool completely and do not stir until cooled completely. 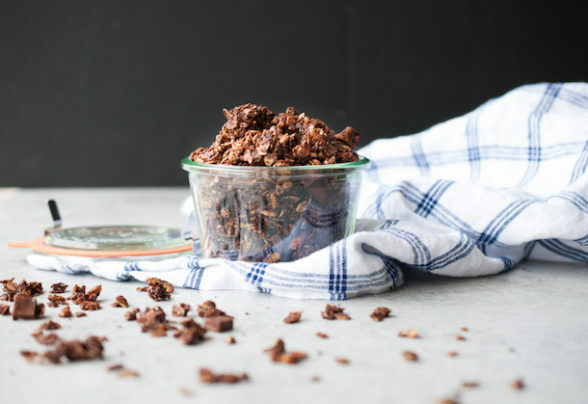 Break into clusters and transfer granola to an airtight container and store at room temperature or freeze. Adding one egg white to the oil/syrup mixture will help create more clusters. Absolutely delicious! Have made it several times, and gets better every time! Awesome! I just made it last night and I had to pull myself away from the pan. So good! Yay! I am obsessed with this granola. Too much so! This looks amazing! One question: Could I use honey as the only sweetener in this recipe? Hi Mary, thanks! Probably, but really not sure since I didn’t try it that way. Err on the side of caution and check on the granola a little early. Just wanted to follow up to tell you that I made the recipe with honey. It’s delicious, but the granola didn’t cluster so well – perhaps a function of the honey. I love it all the same. Thank you! I note that the cooking temperature on this granola is lower than your other granola recipes. Is that due to the chocolate? Just wondering if I could try the lower temp technique with your other recipes and leave the granola in the oven to continue drying, as with this recipe. Thanks! Hmmm….never tried honey so I can’t guess about that. Did you pulse some of the mixture ahead? Yes, you can use the same low temp technique with other granolas, but you must use it in this recipe due to the chocolate which would burn at a higher temp.